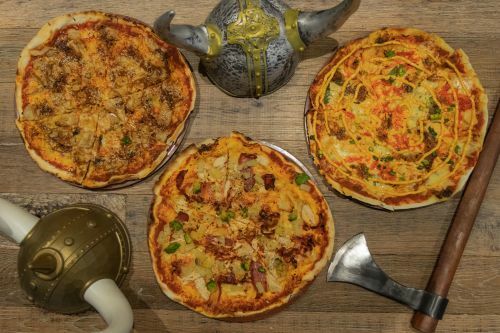 Svens Viking Pizza - Maroubra uses their own specialised couriers to deliver their food. On a Swedish wood fired pizza, thin crispy crust. Medium-11 inches, Large-13 inches. Slow roasted lamb, fefferoni, Roma tomatoes, onion and Swedish kebab sauce. Garlic marinated king prawns, chilli flakes, crispy pancetta, Roma tomatoes and chevre goats cheese. Premium beef eye fillet, sauce bearnaise, fresh mushrooms and onion. On a Swedish wood fired pizza, thin crispy crust. Smoked ham, fresh mushrooms, marinated artichokes and black Kalamata olives. Smoky chipotle, marinated pork belly, avocado, onion, jalapenos and lime aioli sauce. Five spice pork belly and caramelised onion with chilli, roasted garlic, sesame seeds and red chilli flakes. Dry-cured prosciutto, rocket, Parmesan flake and extra virgin olive oil. Spanish chorizo, crispy pancetta, pepperoni, smoked ham and spicy red chilli creme. Baby spinach, slow roasted lamb, Spanish onion and roasted capsicum, garnished with rocket and mint yoghurt. On a Swedish wood fired pizza, thin crispy crust. Medium - 11 inches (6 slices), Large - 13 inches (8 slices). Wood roasted chicken breast fillet, field mushrooms, semi-dried tomatoes and homemade basil pesto. Wood roasted chicken breast fillet, chevre goat cheese, honey and roasted pine nuts. Wood roasted chicken breast fillet, Spanish chorizo, caramelised onion and basil. Wood roasted chicken breast fillet, crispy pancetta, avocado, sweet pineapple and red chilli flakes. Garlic marinated king prawns, chilli flakes, Roma tomatoes, rocket and bocconcini salad with extra virgin olive oil. Garlic marinated king prawns, feta cheese, baby spinach, semi-dried tomatoes and homemade basil pesto. Baby spinach, semi-dried tomatoes, field mushrooms, avocado and marinated artichokes. Fire roasted butternut, pumpkin, feta cheese, baby spinach and roasted pine nuts. With fresh basil leaves and cherry tomatoes. Pepperoni, Cheddar and mozzarella mix. Smoked ham, sweet pineapple, Cheddar and mozzarella mix. Sundried tomatoes, baby spinach, mushroom, eggplant, red capsicum, artichokes and bocconcini. Chicken, roasted capsicum and caramelised onion with chilli, shallots, bocconcini, Cheddar, mozzarella mix and peri peri mayonnaise. Chicken, mushroom, Spanish onion, shallots, mozzarella and feta. Ham, pepperoni, Spanish chorizo, Cheddar, mozzarella mix, roasted capsicum, olives, fresh mushroom and anchovies. Garlic, chilli, marinated king prawns, Roma tomatoes, rocket and bocconcini salad with extra virgin olive oil. Garlic, marinated king prawns, feta cheese, baby spinach, semi-dried tomatoes and homemade basil pesto. Smoked salmon and avocado with potato and dill dressing. Mixed leaves, cherry tomatoes, avocado and Spanish onion with herb dressing. With pine nuts and balsamic vinaigrette. Mixed salad, Roma tomatoes, feta and Spanish onion with balsamic vinaigrette. Lightly dusted with icing sugar.